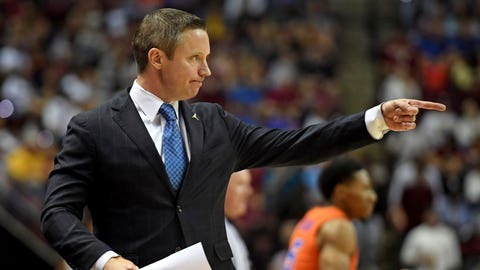 Florida Gators head coach Mike White hopes that the confidence built in the Gators frontcourt will carry over into future games. “Hopefully we’ll have the carry over in terms of the confidence from our frontcourt guys,” Florida coach Mike White said. After La Salle guard Traci Carter cut Florida’s lead to 42-35 early in the second half with a 3-pointer, the Gators answered with 11 straight points. Hayes, who played just five minutes in the first half after picking up two early fouls, scored seven of the Gators’ 11 points during the run on three inside baskets. Keyotnae Johnson finished the run with a dunk in a transition, putting Florida up 53-35 with 13:40 remaining. From there Florida pulled away, leading by as many as 24 points in the second half. Hayes reached double figures in scoring for the first time since scoring 10 points on Jan. 6, 2018 at Missouri. Jalen Hudson scored a team-high 15 points for Florida, while Johnson had 12. Andrew Nembhard, playing through a strained hip flexor, had 4 points and 7 assists and has posted an assist-to-turnover ratio of 13 to 2 over his last two games. “He showed a lot of toughness tonight,” White said. Florida made nine of its first 14 shots to build an early 19-11 lead. The Gators extended it to as many as 12 points in the first half before taking a 40-32 lead into halftime. Senior guard Pookie Powell led La Salle (0-3) with 21 points. The Explorers were playing their first game against Florida since Dec. 18, 1989, a game La Salle won 76-69 behind 33 points from former All-American Lionel Simmons. Florida: The Gators have regrouped with back to back wins after a season-opening loss at No. 14 Florida State. La Salle: The Explorers suffered their worst loss of the season after losing their first two games by a combined nine points. Florida gets a week off before opening the “Battle 4 Atlantis” tournament against Oklahoma in the Bahamas on Wednesday at noon. La Salle will return home to face city rival Drexel on Saturday at 4 p.m.